If the Oregon Ducks men's basketball team doesn't win another game, this season still should count as a successful one. Four weeks ago, Oregon looked immature and disorganized in a 15-point loss at Oregon State. Losses at USC and UCLA followed, and talk of the Ducks being in the NCAA Tournament was laughable. Eight wins later, Oregon is a No. 12 seed and probably not the draw Wisconsin wanted. The Ducks have been playing elimination basketball for a while and seem to enjoy the task. The Ducks and Badgers play at about 1:30 p.m. Friday (TBS) in San Jose, California, where there should be a decent representation of Ducks fans. 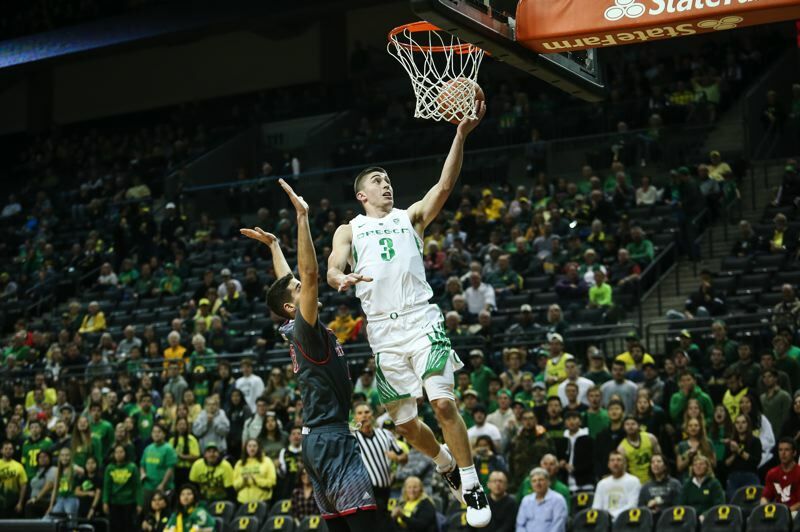 Watching Oregon romp to the Pac-12 tournament title makes one wonder how they could have seemed so dysfunctional less than one month ago, when Kenny Wooten was a masked man and Payton Pritchard often was invisible. Pritchard played at the Pac-12 tourney with a swagger that hasn't been seen since his days at West Linn High. If he keeps it up, and if the Ducks' rim protectors stay out of foul trouble, Oregon can win more games. This is still an offensively limited team. But if there are matchups to exploit, count on Dana Altman to find them. And, unlike a year ago, when Altman never got his team committed to defending, this Ducks outfit seems to embrace defending — and even enjoy it. Makes one wonder how good these guys could have been with a healthy Bol Bol. • The Portland Winterhawks will meet the Spokane Chiefs in a best-of-seven series that starts with 7 p.m. games Friday and Saturday at Spokane. The games in Portland — all at Memorial Coliseum — are March 26 and 27 and, if a sixth game is needed, April 1. Home ice is an advantage to a point — the Winterhawks beat Spokane in a Game 7 at home last season, for example — but the more significant hit for the club will be at the gate. Games played on Tuesday and Wednesday don't attract the same crowds as games on Friday and Saturday, playoffs or regular season. The matchup with Spokane figures to be entertaining. The teams' six contests this season averaged more than nine goals. In last year's first round, four of the seven games between the teams were decided by one goal, two in overtime. And that doesn't include a Game 7 that was decided by two Portland goals inside the final five minutes. The biggest question entering this series is the status of Cody Glass. If he returns from his knee injury and is close to full strength, Portland has plenty of reason for confidence. If Glass doesn't play, this could be a tough ask for the Hawks. • Joachim Blichfeld led the WHL scoring race most of the season, but didn't clinch the Bob Clark Trophy as the league's top points man until 1.1 seconds remained in the regular season, when he assisted on Jared Freadrich's otherwise meaningless goal in a 6-5 loss to Seattle. Blichfeld finished with 114 points (53 goals, 61 assists), one more than Moose Jaw's Tristin Langan. Blichfeld and Lanagan shared the lead in goals with 53 apiece. "It means a lot to him and to us to have the leading scorer in the league," Winterhawks coach/GM/VP Mike Johnston says. "He's earned it. He deserves it." • This space was reserved to write about Portland's professional soccer team. Congrats to Timbers 2 for their 3-1 win in USL Championship play on Saturday at San Antonio FC on the strength of two Marvin Loria goals. As for the MLS side that represents Portland, it owns a dubious distinction as the first MLS team to allow three or more goals in each of the first three games to start a season. The good news is that the Timbers have this week's international break to work out some of the communication problems on defense before visiting the Los Angeles Galaxy on March 31.